Golden rays of sunshine falling through the red and white chequered curtains woke me up in the morning. Feeling refreshed, I had breakfast and packed up my stuff. The sun shone into my face as I stepped out of the door. For the first bit of my hike for the day, I followed the path along Lago di Federa I had already taken the day before. But instead of looping back around to the rifugio, I then crossed over some deserted pastures. After crossing this little river, I followed its gorge for a while. As the descent started, I crossed a river down in a little gorge. My path then followed that gorge. The noise of rushing water got louder and louder, making me expect quite a big waterfall. I did find the waterfall along my way a little later, but it was way smaller than expected. The echoing of the sound in the valley had hugely exaggerated the actual noise made by the waterfall. My path branched off from the gorge and a steep decline through beautiful woodland began. 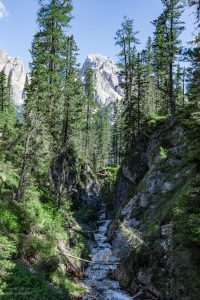 Through a gap in the trees, I had a great view over the valley of Cortine D’Ampezzo. Carefully, I zig-zagged down the slope covered with some loose scree. When I reached a rich, green pasture, the path evened out. I crossed over the meadow, passed though a little patch of forest and crossed two more little rivers, before reaching a road. I knew I had reached the halfway point of my hike to my rifugio for the night. 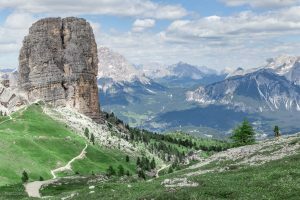 On my way up to the Rifugio Cinque Torri, I saw the group of rocks that had towered over Lago di Federa the day before. After a short break, I crossed the road and disappeared into woodland again. 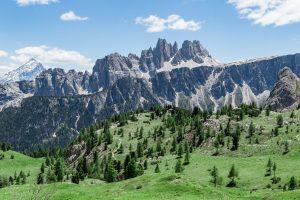 Every now and then, the trees revealed amazing views of the group of rocks, that had towered over the Lago di Federa the day before. These views made me forget how steep the ascent was and how the sun was burning down on me merciless. A lot sooner than expected, my path merged with a gravel road. 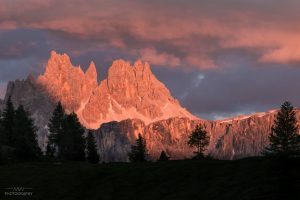 Directly ahead the Cinque Torri rocks majestically rose into the sky. About 200m to the left was the Rifugio Cinque Torri. I rested in the shade a little and looked around. 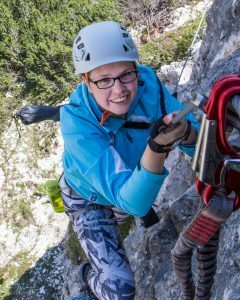 A few climbers were tackling the 90° steep rockface of the Cinque Torri rocks. Their voices yelling instructions to each others echoed back from the rocks. After cooling down, I put most of my stuff into my room for the night and then headed off again. 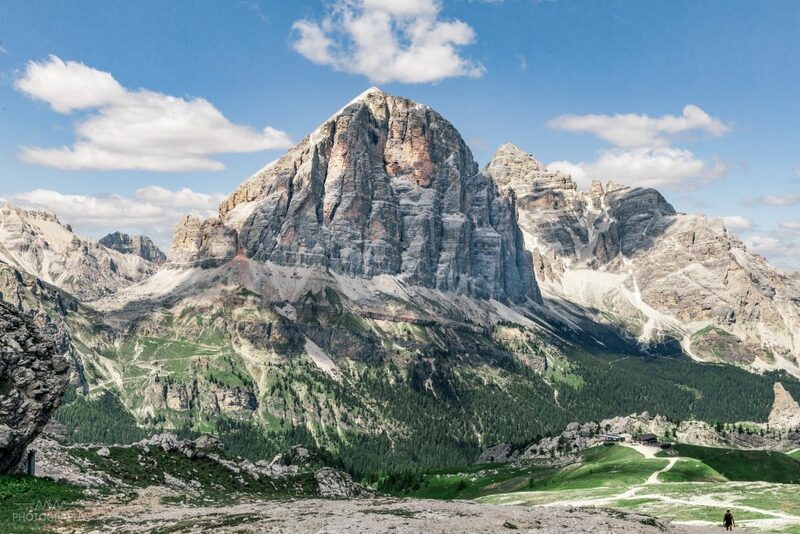 The Cinque Torri rocks were towering over the little Rifugio Cinque Torri. Not far in the distance was a nice mountain saddle that seemed promising for some scenic views. It was an easy walk along a gravel road with many other hikers on it up to the Rifugio Averau. From there, the view into the next valley was spectacular. Layers and layers of peaks rose into the sky as far as I could see. A fresh breeze made the heat of the sun more bearable. These views were what I loved so much about the mountains, the reward after hours of walking, giving me a sense of freedom. 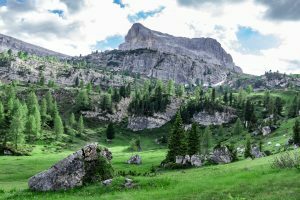 I spent ages wandering across the meadow just below the rifugio, taking in all the views. Feeling a little adventurous, I explored a scree slope that lead along the peak towering over the rifugio. The scenery was beautiful wherever I looked. Everything seemed so small compared to the majestic, old mountains. Slowly I started to meander back to the Rifugio Cinque Torri, stopping wherever I liked the view, going wherever I suspected an equally pretty view. As I stood at the edge of the rocks, looking over the green meadow below with a little stream and a few trees on it, I thought how nice it would be to share this view with James. Another picture perfect sunset brought the day to an end. Back at the rifugio, I treated myself to a superb slice of ricotta strudel, before walking down to the meadow I had seen from above before. Slowly, I strolled around, along the stream, up the small hills, to the trees. I just couldn’t get enough of the mountains. I could have stayed on this meadow for hours, but the prospect of another delicious three course dinner wasn’t to bad either. The sun set with another symphony of colours in the sky. A little cloud got stuck on a peak in the distance, piling up more and more. I took in the last rays of sunshine before darkness, accompanied by a cool breeze.